Striking body shape, high-output humbuckers and compound radius neck. The Jackson JS32T Kelly Electric Guitar makes it easier than ever to get classic Jackson tone, looks and playability without breaking the bank. Upgraded features such as striking aesthetics, new high-output ceramic-magnet pickups, graphite-reinforced maple necks, bound fingerboards and headstocks, and black hardware deliver more for less. The electrifying JS32T Kelly has a basswood body, bolt-on maple speed neck with graphite reinforcement, compound-radius (12"-16") bound rosewood fingerboard with 24 jumbo frets and pearloid sharkfin inlays, and bound headstock. 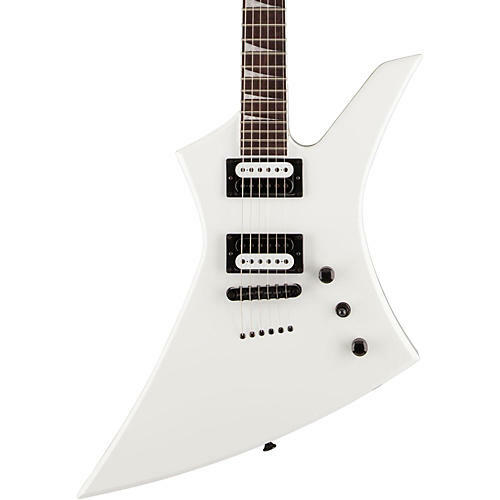 Other features include dual high-output Jackson humbucking pickups with ceramic magnets and three-way toggle switching, adjustable string-through compensated bridge, black hardware and die-cast tuners.